A Virtual CFO, or Virtual Chief Financial Officer, is an outsourced accounting service provider. Growing businesses often reach a point where they need professional financial advice, but can't afford a full-time CFO or controller which ranges from $175,000 to over $480,000 per year, plus vacations, bonuses and other benefits. A Virtual CFO is a less expensive options that can provide you with an experienced accounting support team, at a fraction of that cost. A Virtual CFO can provide a full range of services including: managing bank relationships, weekly meetings, forecasting, company-wide KPIs, and much more. Many firms offer different levels of services that can be tailored to the specific needs of your business. At Summit CPA, we take action-oriented analysis pretty seriously, helping our clients establish KPIs and regular financial reporting as a strong foundation. From reviewing budgets and cash forecasts to helping you raise cash, establish cash reserves, and properly incentivize your employees, we're here to help your company maximize profits and minimize taxes, and to meet the financial needs of your growing company. How is a Virtual CFO different than an accountant? Virtual CFOs are professionals in financial management. That is all we do. Asking an accountant to assist your company in financial management and strategic planning is like asking an architect to take over the role of a general contractor. We're not just a company who accepts outsourced accounting work. Our clients bring us on as members of their teams. You're not just hiring one person. You're hiring our whole staff. An in-house CFO typically carries experience from the few jobs he/she has held, while a Virtual CFO company like Summit CPA Group brings the experience of having worked with hundreds of companies. Why (or when) do I need a Virtual CFO? If you work for a small business, you may only require simpler financial services provided by a bookkeeper or accountant. Chances are, if you're reading this FAQ page, you've likely worked with or are currently working with a bookkeeper or accountant. As your business grows, or if you're planning for growth, your financial needs become more complex. Often your existing financial infrastructure and accounting reporting aren't giving you the kind of visibility you need to make confident, financially sound decisions around growth. How do you communicate with clients? Is it all over the phone? Summit CPA is a distributed company, and we pride ourselves in our ability to offer value remotely. We meet with our clients through video conferencing software where we can see each other face-to-face and screenshare. For more on this topic, our CEO, Jody Grunden, wrote a Medium article: The Tools We Use at Summit CPA to Work Together Remotely. What kind of team does our company gain access to? 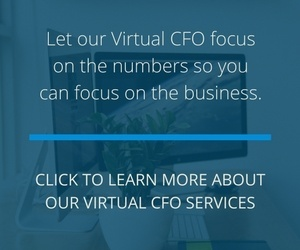 Our full-service Virtual CFO clients are assigned a CFO, two accountants and a tax manager. We're more of a niche design or web development firm as opposed to a larger interactive agency. Will your KPIs still help us? We know the web design and development industry very well. The focus of the KPIs are to figure out “what makes your company tick." Once we have identified the main revenue drivers, we can successfully build a dynamic forecast that you can use to make solid financial decisions. We are constantly monitoring the KPIs to make sure that the assumptions that we are using are solid. And if not, we can dive into secondary KPIs to determine where things are going wrong. For instance, if we are forecasting a team Utilization of 60% and we are consistently falling short, we can dive further in to see if there is a systemic problem or if we simply have to lower our Utilization to a lower percentage. This deep dive is one of the big differences between the Virtual CFO and Controller pricing tiers. For sanity reasons, we have limited our onboarding to no more than 4 new companies per month. Depending on demand, you may have to wait a few weeks before we can officially get things started. I'm nervous about giving you and your team access to my accounting infrastructure. How do you handle data security? We offer secure data-transfer via a client portal and have never experienced data security problems. Do you provide year-round service? Why should I use Summit CPA Virtual CFO Services? Why not? Our team has the experienced “credentials” some companies demand. Due to our being a distributed company we have the luxury of hiring the crème of the crop, with no geographic limitations. Additionally, our team has a profound knowledge of “process” – they know how to tackle tasks, get them done, and meet deadlines. Will the same people always service my account? Our Virtual CFOs all manage an experienced team. While that team may change (due to promotions, role changes, etc.) your assigned CFO will be your main point of contact and that will not change. What are some considerations I should consult with you about on an ongoing basis? Ask us. If we can’t do it—we’ll find someone who can.